Home|Floral Library|Calla Lily – Zantedeschia rehmannii, Z. aethiopica, Z. spp. Decorative Life: Ranges from 30 to 65 days with the longer time when being held at 65F. One report states that two to three flowers should be fully colored at the time of harvest. Using ‘Childsiana’, another report states that they should be harvested in an early bud stage, before the spathes expand. Member of Araceae (arum family). Native to southern and eastern Africa. Common relatives include anthurium, philodendron and dieffenbachia. Flowers solitary at stem ends. Flower consists of 3 inch long, funnel-shaped colored spathe enclosing a yellow finger-like spadix. Plant is a perennial from rhizomes, classed as a monocotyledon, leaves mostly parallel veined. Hold at 36-38F for no longer than three days. 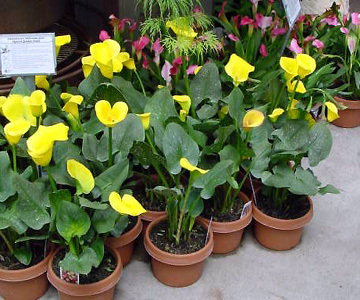 Straight-stemmed with glossy green leaves, the Calla Lily”s most characteristic trait is the yellow, finger-like spadix that emerges from the base of the flower”s funnel-shaped spathe. Scientific name in honor of Francesco Zantedeschia who wrote about Italian plants around 1825. This particular species was discovered in South Africa by Mr. Rehmann, hence the specific epithet name of “rehmannii”. Will generally do well in light levels at least bright enough to read a newspaper in comfort. Many colored cultivars being developed in New Zealand; crosses of Z. elliotiana, Z. rehmannii and Z. albomaculata. Plummer et al. (1990) studied the effects of flower development at harvest on shelf life and found that buds just emerging from the axil (stage I) lasted on average 26 days compared to 11 days when harvesting them fully opened but before pollen shed.